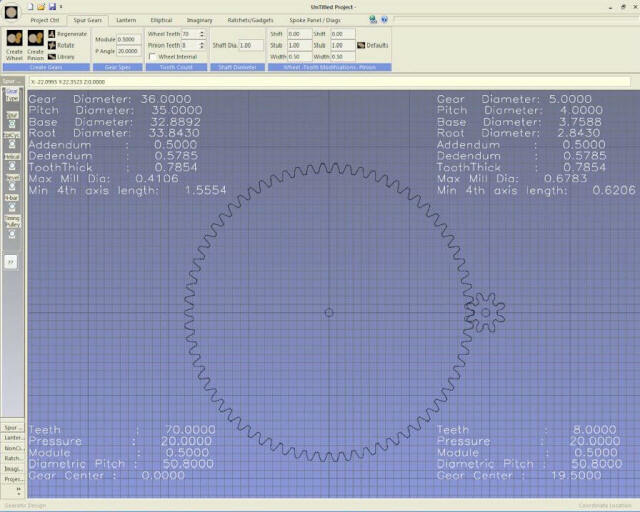 Cycloidal gear. 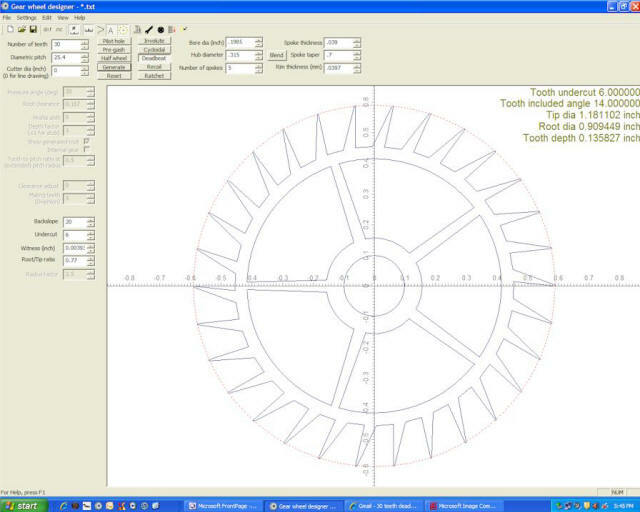 Gear Wheel Designer software creates a variety of clock gear types & generates the 2.5D g-code. 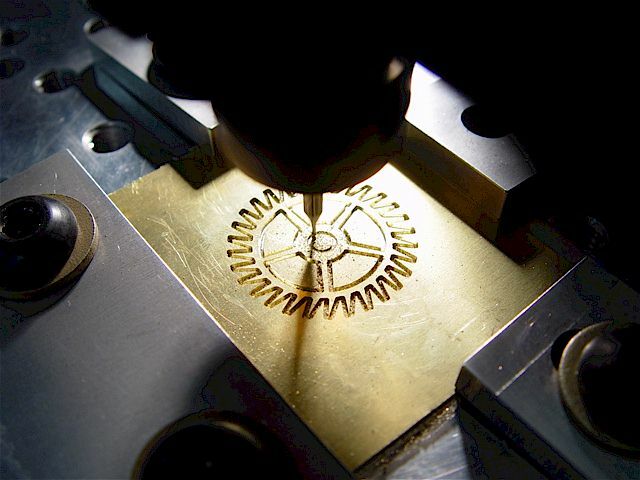 The units can be metric or imperial, the sequence of operations can be specified, & it will also cut spokes. 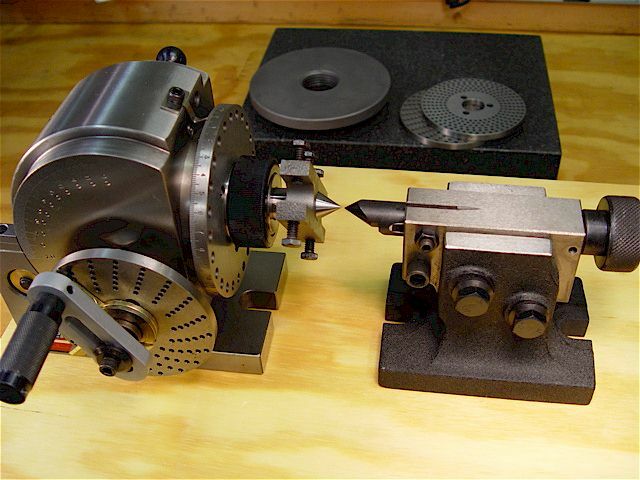 It only cuts flat stock so you are limited by the size of the end mill (for small detail) & the depth of the cut. 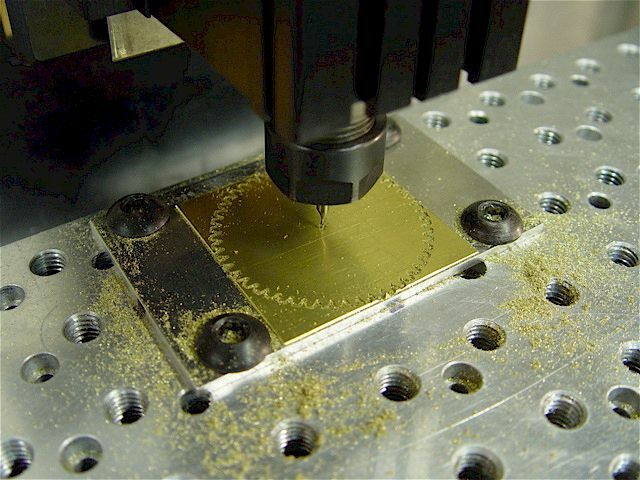 Used a 1/32" carbide end mill to cut a deadbeat escapement, below. This limited the speed & depth of the cut. This software is 2.5D only. 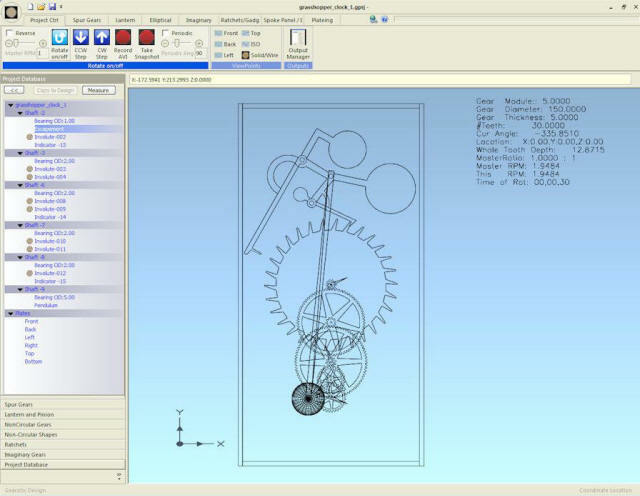 Gearotic Motion is a far more sophisticated 2.5D & 3D (4th-axis) solution. 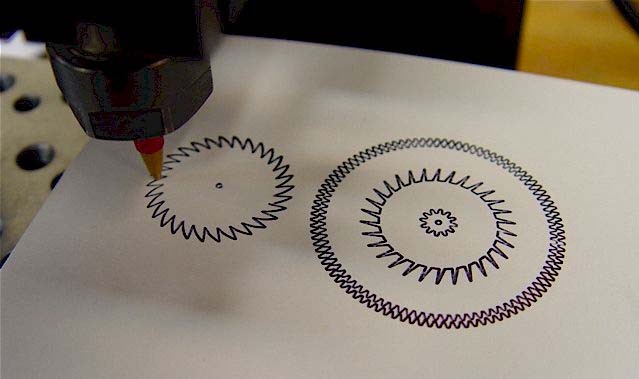 Three curves are used above & below a gear's base circle to design cycloidal gears. Cycloid. 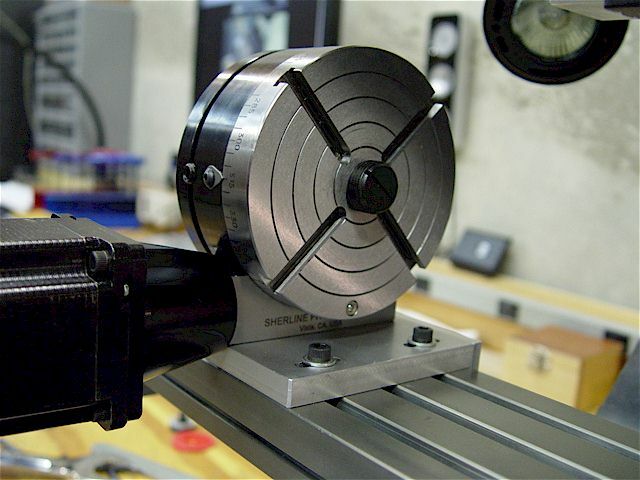 A rack would use true cycloid profiles. Epicycloid, the shape above the base circle. Hypocycloid, the shape below the base circle. 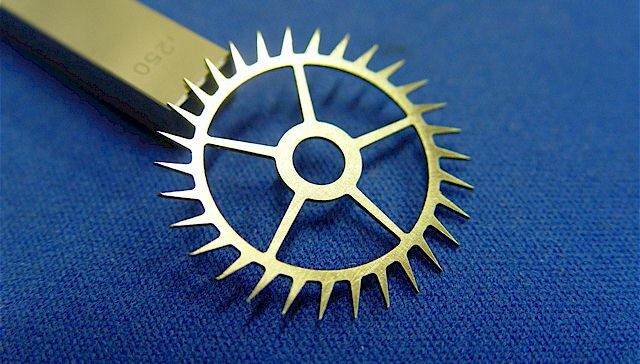 A CNC-made deadbeat escapement wheel that has 30-teeth. 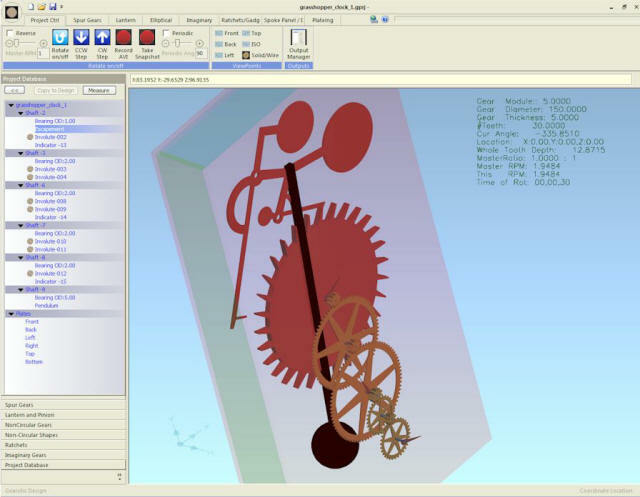 The path is depicted by a virtual marker at the end of a taut string as it unwinds off a cylinder (the gear's base circle). 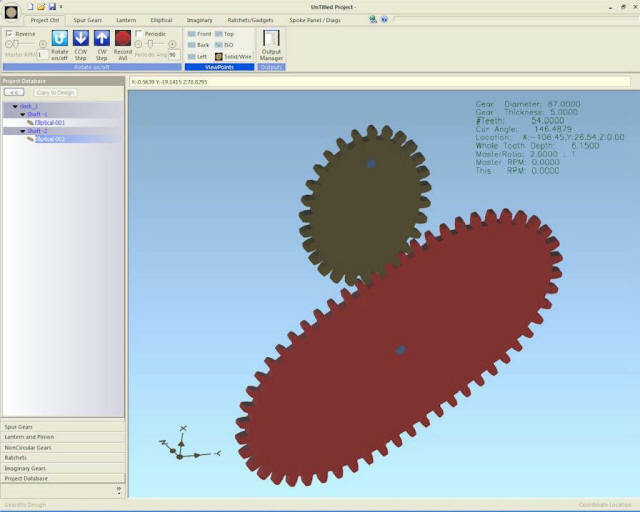 Spur gears incorporate the involute shape. 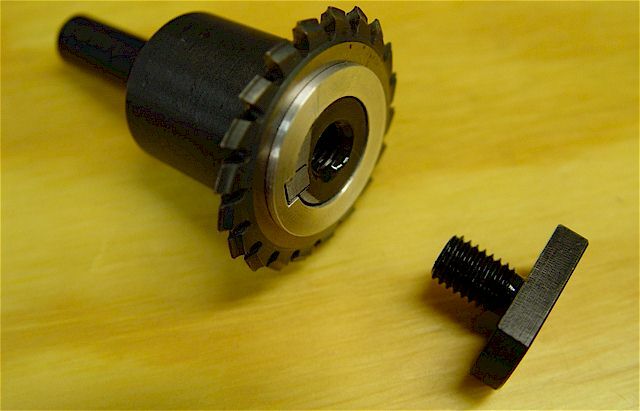 A simple gear can be defined in terms of its pitch, pressure angle, & number of teeth. 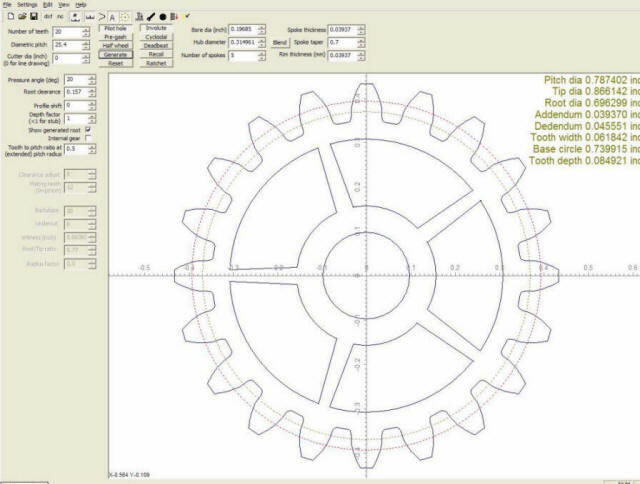 Gear Wheel Designer generates G-code for CNC applications, like Mach3. An involute gear example. The outer dashed circle is the pitch circle & the inner one is the base circle. The involute shape is calculated from the base circle. 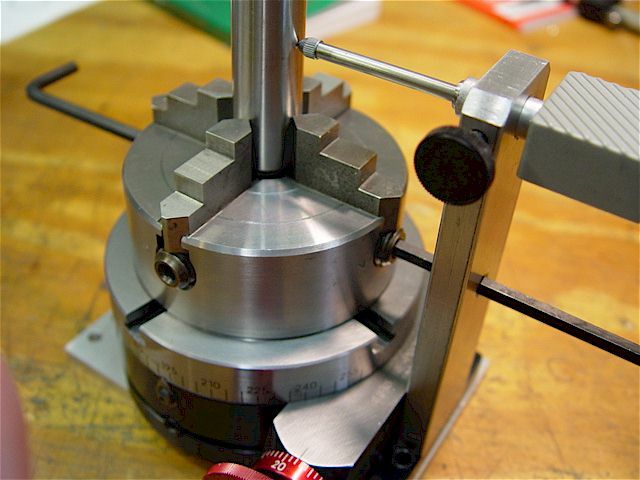 The ratio between the two circles is used to derive the pressure angle. 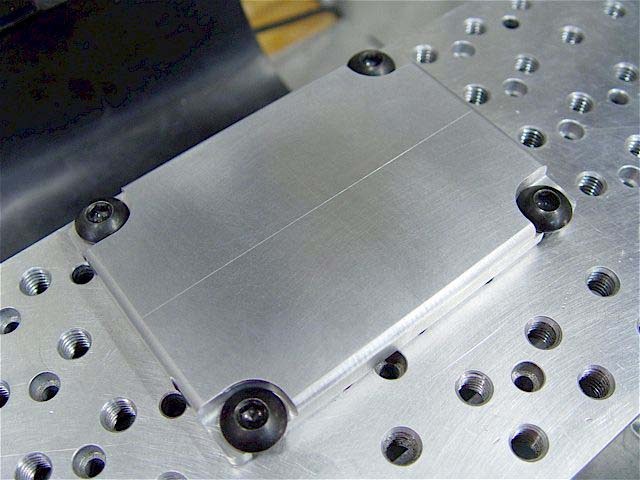 Low-profile fixture (0.1225"). Note the slotted holes in the back for quick, slide-in/slide-out mounting. 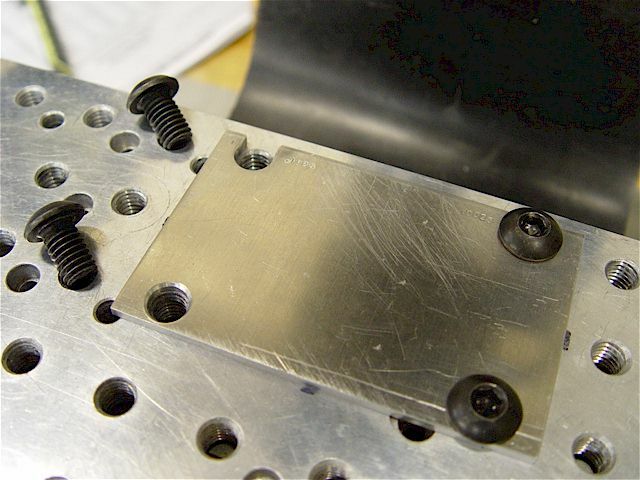 After degreasing, the brass plate is mounted using double-sided tape. 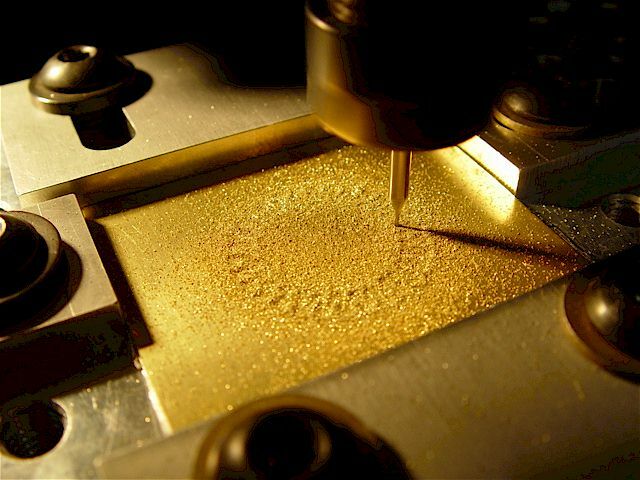 The end mill is set to 4.0000" above the brass plate's top surface in the Mach3 Z-axis DRO. 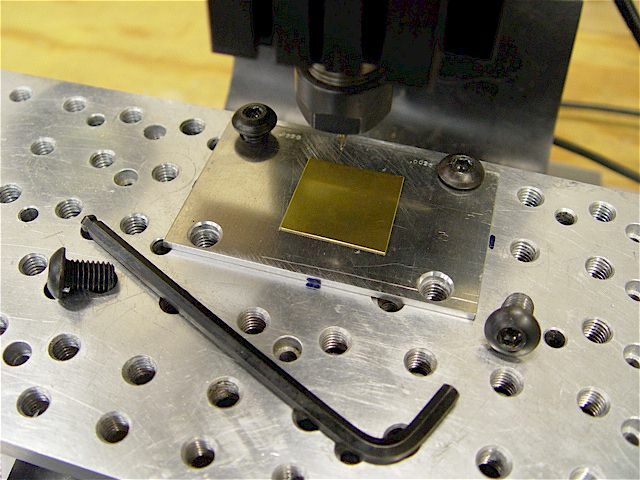 The clear, 3M tape is 0.0025" thick so the final cut is set to 0.002" below the 0.025" thick, brass plate. 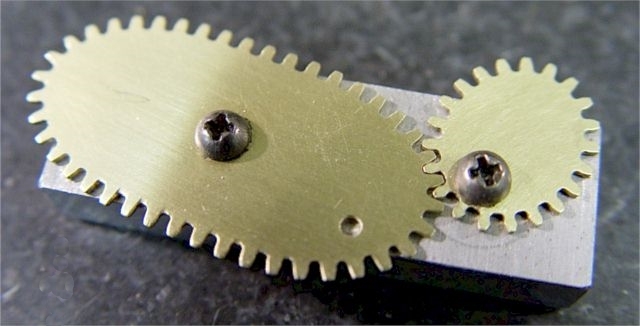 The gears have no burrs if the last cut ends in the tape layer. 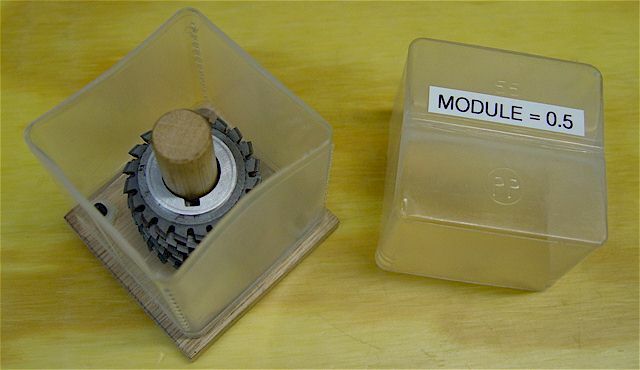 These are module = 1 (25.4 DP) gears. The fixture returns to the same position using four 1/4" indexing pins. below the top surface. Lightly scribed alignment lines mark the plate's center. The outer edges have radii. Involute gear animation. 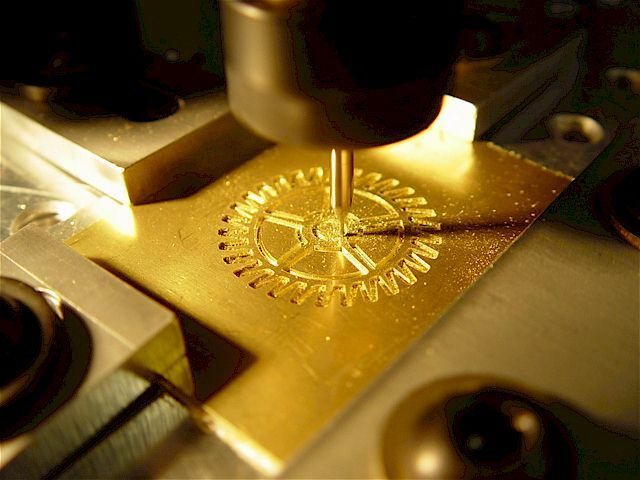 Not for a clock but another example of Mach3 controlled CNC produced gears. imaginary. 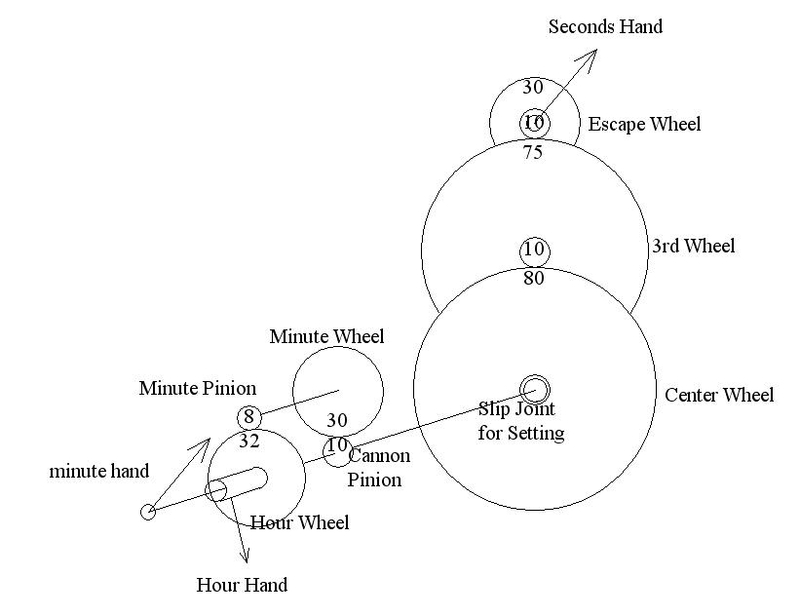 It can make short AVI movies of the gear train in motion; the master (first) gear speed & direction can be controlled. Periodic reversing motion can be specified over a defined angle. Different spoke designs plus hand cranks & clock hands are available. Spur gear window used to create wheels & pinions using metric module or imperial diametral pitch specifications. 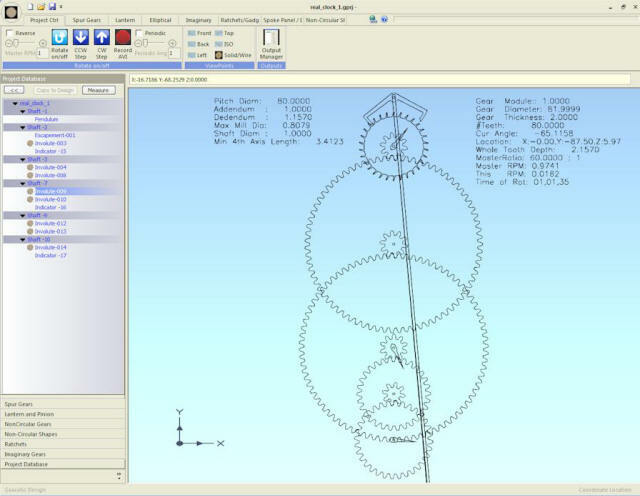 GM can design & cut elliptical gears. A ratchet shape in the ratchets/gadgets window. A recoil shape in the ratchets/gadgets window. Latest Gearotic Motion version (2015). 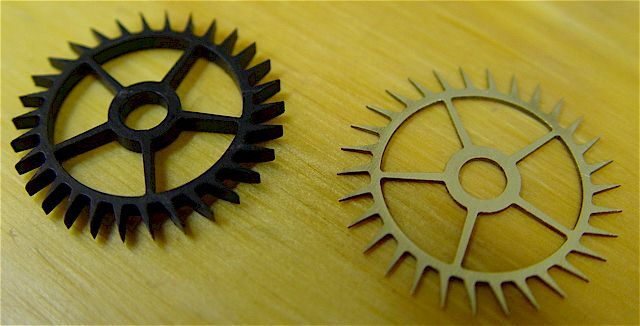 Escapement wheels made of ABS plastic & brass using CNC mill. 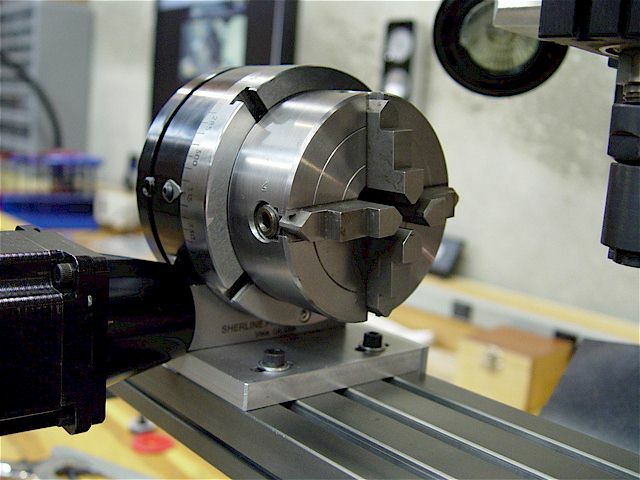 form-relieved cutting teeth, 20 deg pressure angle, 16mm bore with keyway, nominal 40mm OD (Hong Kong). Modified the supplied packaging to safely hold the cutter set. The 5/8" wooden dowel contacts the lid. 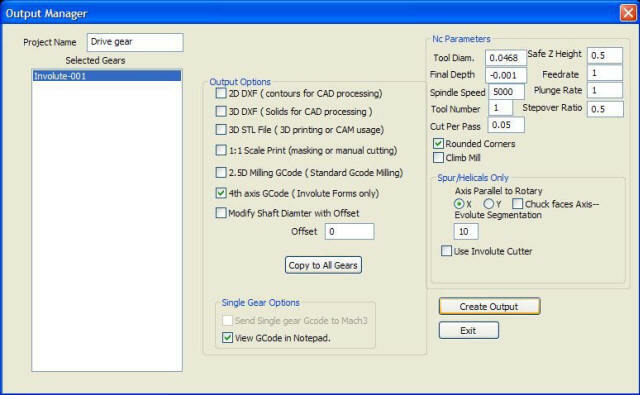 Note: metric module & diametral pitch (DP) cutter numbers are inverted. 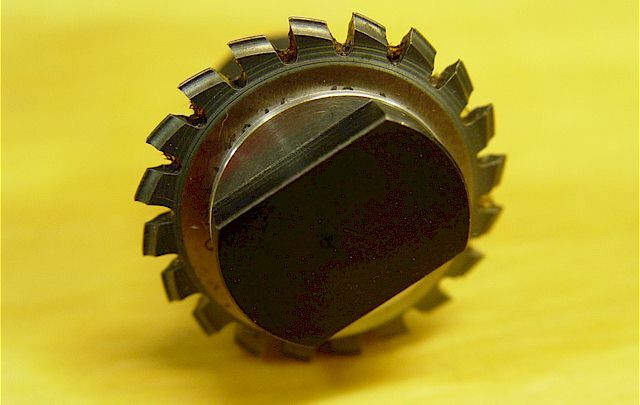 Proxxon 24 425 black-oxide HSS 16mm arbor for involute gear cutters (Germany). 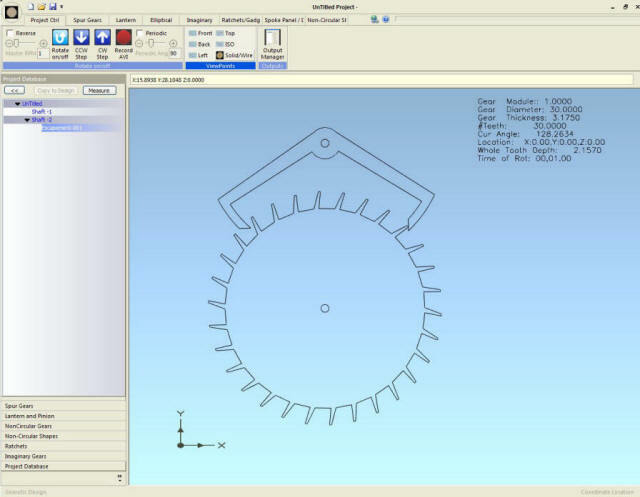 This arbor was designed for small-module cutters (e.g., M = 0.5, 0.6, 0.7, 0.8). The cutters are not quite thick enough for secure clamping so a custom 0.0525" thick washer was made. Dividing head with its center & integral dog. The 1-1/2-8 threads are protected by the supplied plastic collar. Also shown is its adjustable tailstock. 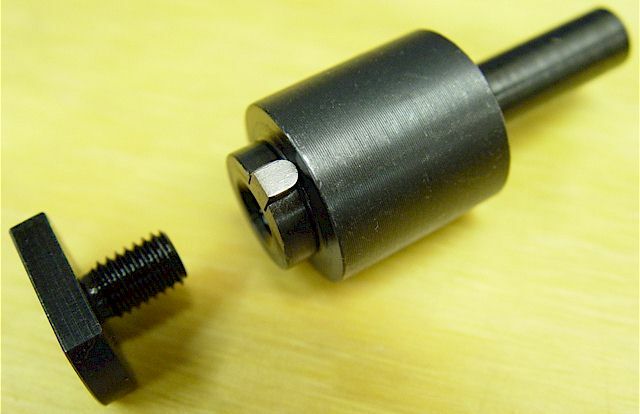 Threaded (unfinished) chuck adapter & additional index plates (top). (a) Diametral Pitch (DP) is measured at the Pitch Circle (PC), not the Outside Diameter (OD). 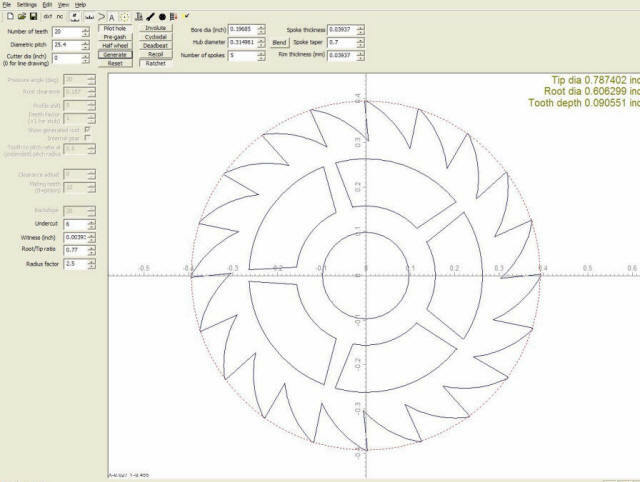 G1 = # of teeth for Gear 1. 1" = 25.4 mm. 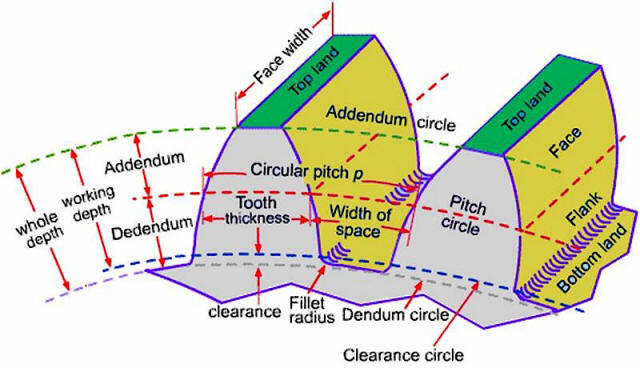 (g) A 20 deg Pressure Angle (PA) has a better tooth form for cutting pinions than e.g., a 14-1/2 deg PA.
involute generated on & from the Pitch Circle is between the addenda, only. 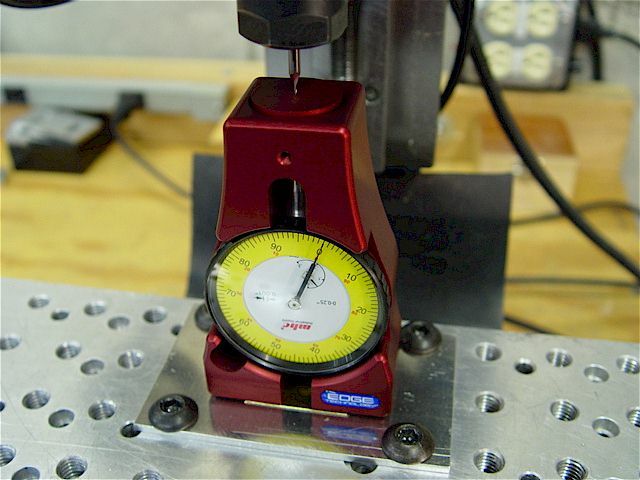 Dedendum & total depth when clearance = 0.1666 x module or one-sixth module. 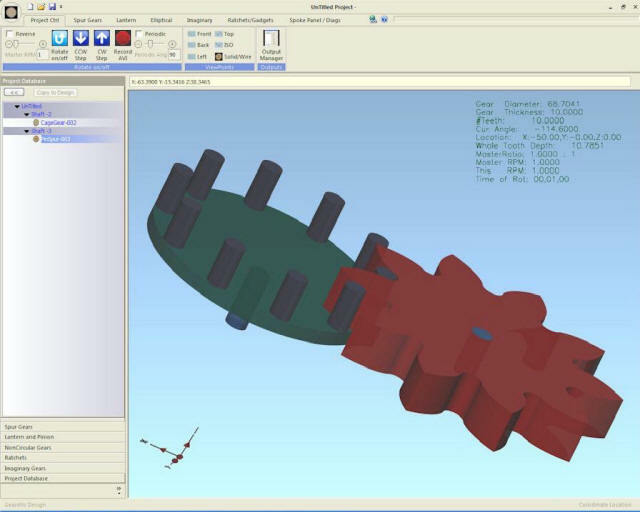 Total depth equivalent to American standard full-depth teeth where clearance = 0.157 x module. 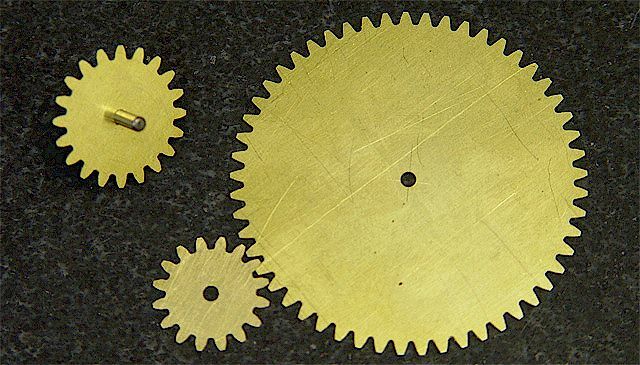 teeth are called pedals while the larger gears are termed wheels. 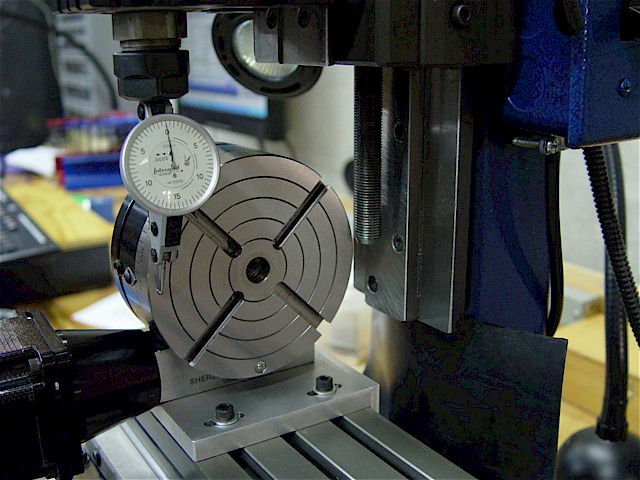 Indicating the rotary table face by performing adjustments both horizontally & vertically. 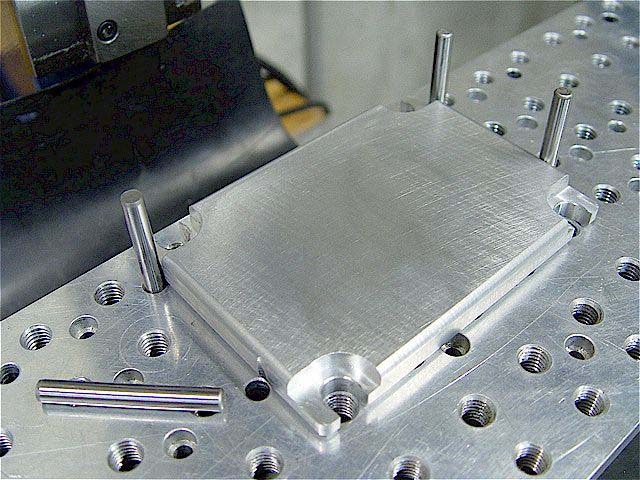 A rotary table alignment bracket is used to initially center the part before transferring to the 4th-axis for final tramming.